Prominent & Leading Manufacturer from Chennai, we offer donracks pallet racks. We are offering fine qualityPallet Racksthat are widely used in food & beverage industry, dairy industry, chemical industry, sanitary industry, electronic industry etc. 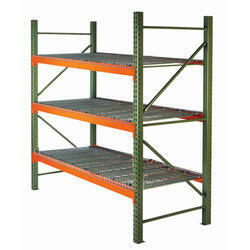 These racks have supreme load bearing capacity and are have longer in functional life. It is suited for the storage of goods, which are moved taken out and stored frequently. The racks are available in customized as well as in standardized sizes.